THERE have been more than 6,500 arrests in Northern Ireland for driving while under the influence of drink or drugs during the last two years. The new police arrest figures obtained by The Detail, which are being made public for the first time, come as the Northern Ireland Assembly examines legislation that could see the drink-drive limit reduced by almost 40%. The figures show that between May 2012 and May 2014 over 80% of those arrested were men, while the most common time of arrest was between 12am and 6am. There were almost 30 arrests for drink or drug driving offences related to individuals aged 15 and 16. The oldest person arrested was 86-years-old. Commenting on the statistics PSNI Road Policing Inspector Rosie Leech said extended licensing hours could help explain the high number of early hour arrests. Inspector Leech said the lack of public transport or taxis also enhances the chance of “flawed decision-making” to drive when under the influence. There were a total of 7,000 convictions for driving under the influence of drink or drugs during the years 2010, 2011 and 2012. One-fifth of the convictions were dealt with at Belfast’s Laganside Court. A map below compiled by The Detail shows the spread of offending across Northern Ireland. The average age of arrest was 36-years-old and the most common age range for convictions was 30 to 39-years-old. Over 90% of the convictions resulted in a fine and there were almost 100 prison sentences. Men represent approximately 80% of arrests and convictions. The information on arrests and convictions are taken from separate time periods but together show the scale of offending when it comes to driving under the influence. Stormont’s Environment Committee is preparing to scrutinise proposals for the biggest shake up in drink driving laws since the alcohol limit was first introduced in 1968. Under the plans, the permitted blood alcohol limit would be reduced to 50mg of alcohol in 100ml of blood – down from the current UK limit of 80mg. Environment Minister Mark H Durkan said that tackling the problem of drink driving was key to “realising the vision of zero deaths on Northern Ireland’s roads”. WHO IS MOST LIKELY TO GET ARRESTED? The data released by the Police Service for Northern Ireland (PSNI) through a Freedom of Information request shows that there were 6,591 arrests for drink or drug driving offences between May 2012 and May 2014. PSNI Road Policing Inspector, Rosie Leech, said the rate of offending is too high. In Northern Ireland the police can request a breath test when they have reason to suspect a person is driving under the influence of alcohol. This can be when a driver commits a traffic offence, or is involved in a collision. When this happens the driver is obliged to provide a breath test at the roadside and if they are found to be over the alcohol limit, they will be immediately arrested. If an individual refuses to do a test and police suspect alcohol is present then they will also be arrested. In the figures obtained by The Detail, almost half of the arrests were for people having excess alcohol in their breath. Other reasons for arrests included failure to provide a specimen of breath or urine for test and driving when unfit through drink or drugs. There is currently no technical device suitable for police to detect drugs in saliva, so they have to rely on a number of impairment tests such as the finger to nose test, pupil examination and blood samples. Inspector Leech said that anecdotal evidence suggests that males are more likely to be “risk takers” when it comes to driving under the influence. 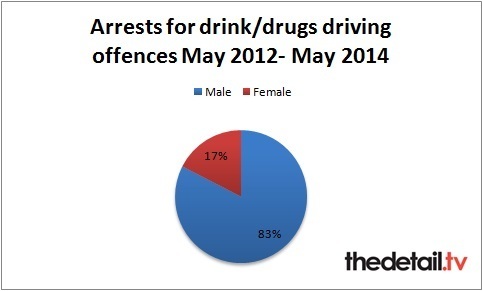 The figures obtained by The Detail show that men accounted for 80% of all drink and drug driving related arrests over the last two years, while the average age of arrest was 36-years-old. 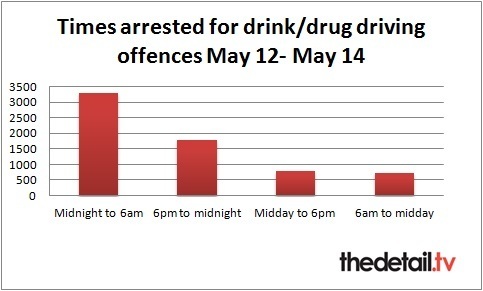 The most common month of arrest during the two year period was May, while the most common time of arrest was between midnight and 6am. Inspector Leech said there are a number of factors at play that can influence these figures. She said: “The advent of extended licensing hours has played a part in the early hours detections. We know the unavailability of public transport or taxis also plays a part in flawed decision-making to drive. People socialise in the evening and it makes sense that is when they’ll be caught. From May 2012 to May 2014 period were eight cases of people arrested for either causing death or grievous bodily injury by driving carelessly with excess alcohol. The latest PSNI figures for those casualties killed or seriously injured due to a driver being impaired by alcohol or drugs show the number has fallen by 63% in a five year period, from 136 in 2009 to 50 in 2013. According to police figures careless driving is the main cause of death on Northern Ireland’s roads. There were 57 road deaths in 2013, with careless driving accounting for the majority of the deaths, followed by excessive speed and then driving under the influence of alcohol or drugs. Fifty-seven people have already lost their lives on the roads so far in 2014. Minister Durkan, said the new Road Traffic (Amendment) Bill had a role to play in reducing the number of road deaths. The Minister said: “The limits I am proposing are already accepted as the norm in many countries across Europe and I believe road users here have the right to that same standard of protection from impaired drivers and riders. The bill was introduced to the Northern Ireland Assembly by the Environment Minister on 12 May 2014. 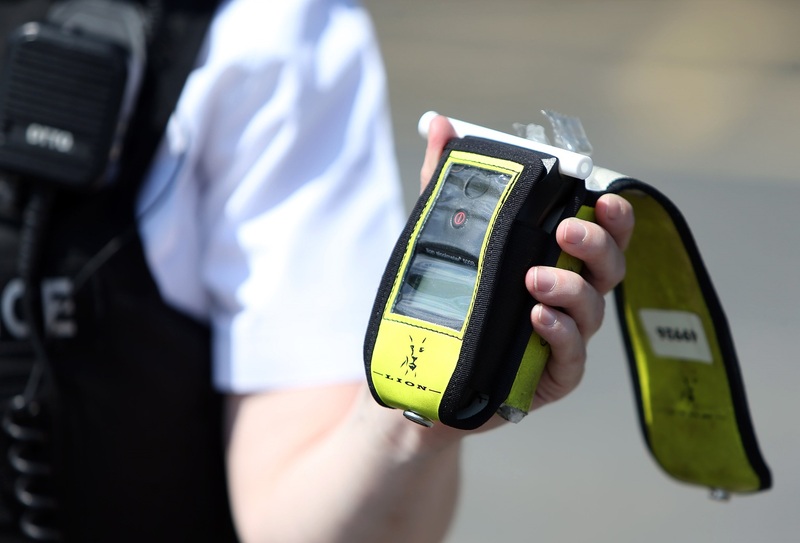 It proposed a new drink drive regime that would mean lower limits including a de facto zero limit for learner drivers, newly qualified drivers and professional drivers. Other changes would include a new graduated penalty regime, increased enforcement powers and greater use of Drink Drive Rehabilitation Schemes. During the summer Stormont’s Environment Committee launched a public call for evidence about the current proposals in preparation for scrutiny of the bill. Concerns have been raised by some MLAs that the bill does not do enough to address the specific problem of driving under the influence of drugs. Police say there can be a number of reasons that an individual arrested on suspicion of driving under the influence is not convicted of the offence. This can include the person arrested providing a sample that is below the legal limit when they are tested at a Police station following their arrest. Figures released to The Detail by the Department of Justice (DoJ) under FoI outline that there were over 7,000 convictions for drink/drugs driving offences between 2010 and 2012. Using the figures The Detail has compiled a geographical breakdown of the number of convictions for drink/drugs driving offences by court office (see map above). The top five courts with the highest number of convictions occurred at some of Northern Ireland’s busiest court houses with one-fifth of the convictions over the three year period occurring at Belfast’s Laganside Court. Over 80% of the convictions were men and there were over 44 convictions of people between the ages of 10 and 17. The most common age range for conviction was 30-39. The figures show that while 90% of the convictions resulted in a fine, almost 100 convictions resulted in a prison sentence and there were 270 suspended sentences. In June this year the Environment Committee passed a motion to extend the study of the Road Traffic (Amendment) Bill until March 2015 in order to allow it to “fully exercise its scrutiny powers on this highly significant legislation”. Inspector Leech said that the police were already preparing for potential changes in the law. She said: “In tandem with the reduced limits, police are also getting ‘random’ breath testing powers. We intend to commence random breath testing in advance of the lowered limit coming into effect.